The proven lower Rg, OVERSIZED PATENTED DIAMOND tm core with our most aggressive mid-lane shell yet, ION tm Resin cover stock will get this ball into an early roll and hook through the backend, even in the oiliest conditions. 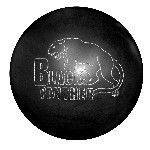 If your bowlers are looking for one mean ball with lots of bite, the Black Panther is here! Likes: Love the way this ball reads the lane, does not overhook or jump like many others I throw, and I have over a dozen I carry with me most of the time. I received this ball before it was released to the public, and had a lot of people asking what it was, using it for the first time on the first night of end of the year roll-offs and it did GREAT!! I am averaging 190, but was high on the pair with 689, when all three 200+ bowlers couldn't break 600. I really LOVED the way this ball sat in the pocket and carried GREAT, whether light or heavy.